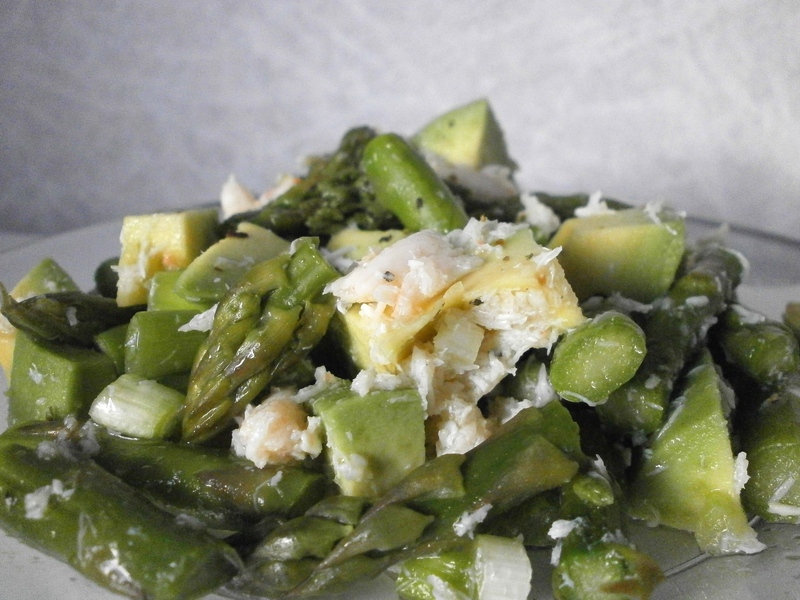 A strong contender for the ultimate spring salad, here we have a simple trifecta of crab, avocado, and asparagus. With surprisingly affordable ingredients, one taste proves that you can indulge in fine fare without paying steep prices. If you happen to be a crab connoisseur, you could opt to splurge on jumbo lumb crab meat for this. However, as a landlocked frugalista, I chose the simple canned crab route. The taste was still fantastic, and the cost stayed under $2.00 a serving (for four people). I first made this quick seafood salad for a spring potluck meal, where it was very well received. So well that in order to get more than a tiny bite, I had to make it again. Using some leftover asparagus, I made a small batch just for myself. After five minutes of minimal effort, I reaped a happy reward. The spritely taste and simplicity of preparation are already prompting me to make this salad again soon. It might need to become a weekly tradition while asparagus is in season. When the rest of the family is eating pizza on Sunday nights, I can gladly turn to this and offer my pity–and perhaps a taste. Bring 6 cups of salted water to a boil. Fill a separate bowl with 6 cups of cold water (ice is optional). Blanch the asparagus in the boiling water for 1 to 2 minutes, depending on how thick the spears are. Transfer the hot asparagus with tongs and plunge the spears in the cold water to cool. Remove asparagus from the cold water after a few minutes, and chop into 1-inch pieces. In a small non-reactive bowl, blend together lemon juice, oil, salt, and seasonings. Stir in diced green onions, followed by the crab meat. Peel and dice the avocado. 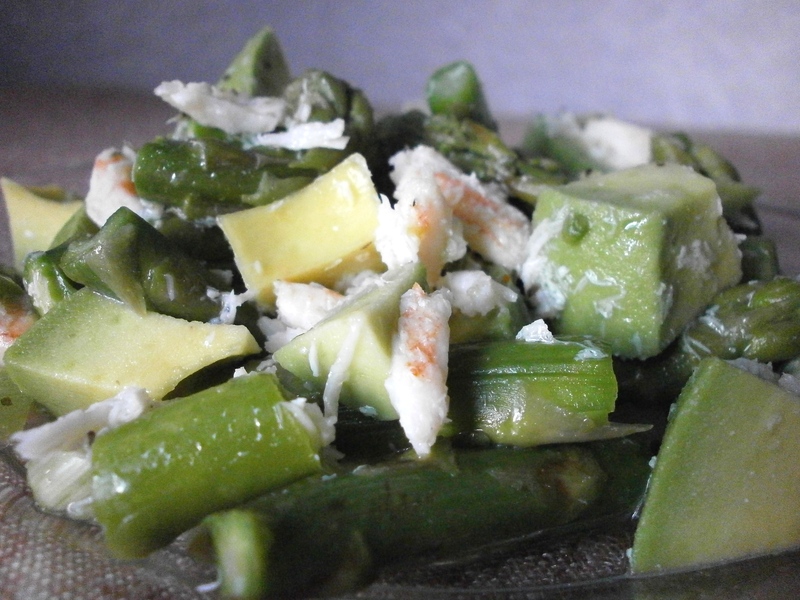 Gently toss the asparagus, crab, and avocado together. Adjust the salt and seasoning to taste. Pennywise Platter Thursday, Foodie Friday and Saturday Dishes. Love crab, this flavor combo sounds great! Thanks for linking at SAturday Dishes. Pinned. Thanks so much! I hope you are able to try it soon. I just froze a bunch of fresh asparagus so that I can make dishes like this all year long! Looks tasty! Saw this at Saturday Dishes link party! Thanks for stopping by! Do you get your asparagus locally? We’ve still got snow on the ground, so it will be a while until we can get it locally grown up here. Love the flavour combos in this salad! I love a crab salad in the summer it is so refreshing and the perfect light dinner. Great recipe! I just started what will be a year long series of salad recipes and being a lover of all the ingredients listed here, I’m going to add this to my must-make list. And I’m Sure I could make it a weekly tradition too. If you love the ingredients, I think you’ll really enjoy this! I’ll have to check out your salad series too! Love them!